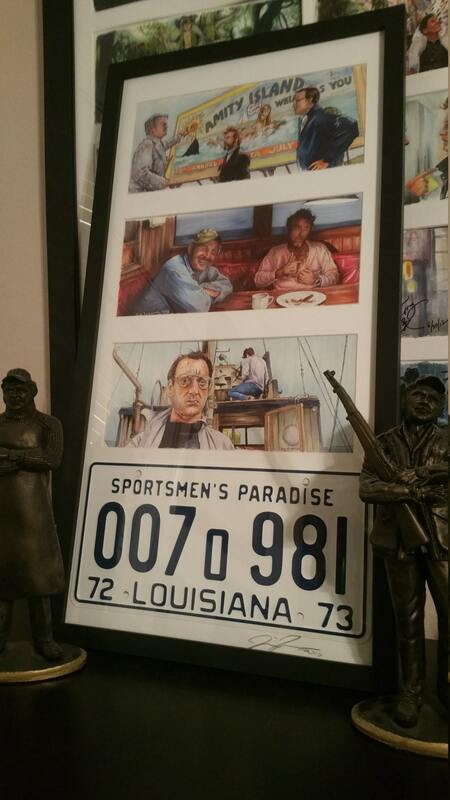 Three of my 5"x11" Jaws art prints with the Louisiana plate pulled from the tiger sharks belly Replica Metal Stamped Screen Accurate License Plate framed. Frame is 14"x27" and black frame and white mat signed. The individual pieces are great; framed together, they are even better! Such a fantastic, creative and eye-catching piece. It looks even better in person, and I loved the picture. I also ordered "Back to the Future." Fast shipping and secure packaging. I highly recommend. A very good price for how creative it is and framed. Beautiful artwork! Love the colors, design, and overall creativity.